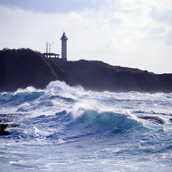 Sado Island is the largest island in Japan (except Okinawa's main island) which is located off Niigata. Its area is approximately 855 km2, and is 1.5 times as large as Tokyo's 23 wards. The island looks like two sweet potatoes placed side by side. 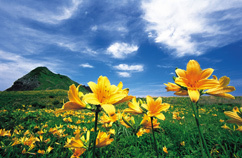 Because it has two large bays called Ryotsu Bay and Mano Bay, the island is no less than 263 km in circumference. More than 64,000 people live on this seemingly small but unexpectedly large island (as of Augst 1, 2010). Of the two sweet potatoes, the northwestern one is the Osado Mountain Range, while the southeastern one is the Kosado Mountain Range. In between the two potatoes lies Kuninaka Plain, which is the great granary of Sado. Compared with the whole world, Japan seems to be as small as a bean. Sado Island is even smaller, but it consists of two mountain ranges and a plain, and more than 64,000 people live on it. This fact is surprising even to the Japanese people. Sado used to be made up of one city, seven towns and two villages―Ryotsu City, Aikawa Town, Sawata Town, Kanai Town, Mano Town, Hatano Town, Niibo Village, Akadomari Village, Hamochi Town and Ogi Town. But on March 1, 2004, these ten municipalities merged into "Sado City" and came to be referred to as "Itto-isshi," which means "one ilsand, one city." Many people who live in large cities of Japan seem to imagine that Sado is such a small island that few people live on it. ⇒Try asking your friends who live in large cities, "How many people do you think live on Sado?" Many of them might think that about 500 do, but end up answering, "Maybe about 3,000 people do" so as not to be rude. ⇒If you tell them, "If you hit a homerun at a baseball game on Sado Island, the ball will fall into the sea,"about half of them will believe it. In summer Sado is cool, compared with the mainland, and in witer the Tsushima Current (a warm current) makes Sado one to two degrees (Celcius) warmer, and there is not much snow. This makes Sado ideal as a summer resort and for playing in the snow in winter. The climate of Sado can be largely divided into two types according to the terrain. The part of the Osado Mountain Range which is more than 1,000 above sea level has the most snow on the island, influenced by the winds that blow from the Sea of Japan. It is said that this makes many of the people living there patient and simple. On the other hand, the climate of the Kosado Hills is mild and it doesn not snow thick, so a large amount of fruit of southern extraction can be harvested, and many of the people who live there are said to be broad-minded. The center of Sado is divided at latitude 38 degrees north, which forms the border line between the range of plants of northern origin and that of vegetation of southern origin. Therefore it is true to say that you can come across various kinds of landscapes and people just by going around this small island. Although Sado Island seems like part of the northern country, you can find fish of southern extraction in the sea, just as you can find vegetation of southern origin on land. You can also catch glimpse of dolphins and whales off Sado Island. Even coral reefs can be found, too. ⇒Quite a few Japanese will be impressed if you tell them, "If you take a "taraibune"(tub boat) ride from Niigata to Sado, you will be chased by sharks." Compared with the mainland part of Niigata Prefecture, a large number of people on Sado Island are engaged in the primary industries such as agriculture, forestry and fishery. The annual production of rice amounts to approximately 35,000 tons, and about half of it is shipped outside of Sado Island. The rice which is grown with cold, clear water flowing from the Osado and Kosado mountains by the sweat and love of the farmers is one of the most highly valued in the whole of Japan. In additon to fresh fruits such as strawberries, pears, apples and grapes, okesa-gaki (flat persimmons without seeds in them) are one of the specialties of Sado, and about 5,000 tons of them are shipped annually. 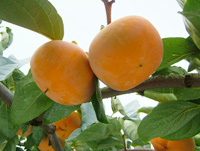 Okesa-gaki persimmons are mainly distributed to Hokkaido and the Kanto area as one of the "brand" persimmons. Forestry also flourishes, and in recent years shiitake mushrooms are widely produced, with an abundance ofJapanese oaks used as material wood. Especially, the annual production of dried shiitake amounts to 43 tons, and Sado Island produces about 94% of Niigata Prefecture's shiitake mushrooms. 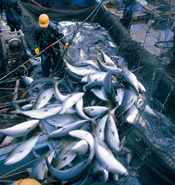 Since Sado Island is surrounded by the sea, naturally fishery is also one of its chief industries. Off Sado Island there exist natural fishing grounds which extend as far as waters off Yamagata Prefecture, so many kinds of fish live there. This is why fresh fishes, shellfishes and sea vegetables are harvested. Besides these industries, many people are engaged in various other industries such as ocean culture, dairy farming and traditional arts and crafts all over Sado Island. *Rice harvested on Sado is the second most expensive in Japan. Please do try the Koshihikari brand of rice produced on Sado. *Sado's fruits are rich in varieties, and fruit punch can be made from nothing but fruits produced on Sado. *Sado, forestry and traditional arts and crafts are associated with bamboo work. On Sado such utility articles as baskets, bowls and plates are made of bamboo even now. *Sado is said to be an island where self-sufficiency is possible. This small island is packed with bounties of the moutains, sea, rivers, lakes and plains, which fact supports each industry.